A super smoothing and hydrating conditioner for hair that just cannot be repaired or hair that is naturally dry or hair that lives in a very dry climate. It will nourish dry hair and make split ends unrecognizable. This formulation is still packed with antioxidants as this gives the hair a healthy glow and stops the hair from losing any more moisture. Absolutely beyond love this product!!! 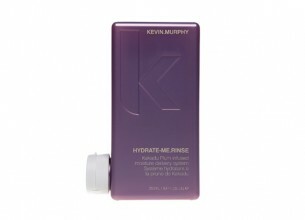 You just cant go wrong with Kevin Murphy. It’s expensive but it is worth every single cent of it. This hydrate my rinse is the most luxurious conditioner and it perfectly hydrates hair and smooths it out that split ends seem less visible and hair is a lot more managable. It also smells and feels like heaven! Best ever hehe, I can’t stress enough how amazing this brand is. It smells so nice that it is like aromatherapy while you wash your hair. The packaging is super pretty. All Kevin Murphy product are sulfate & Paraben free as well as cruelty free. I really enjoyed this conditioner. I only needed a drop for it to make my hair manageable and soft. I have highlighted hair and often find my ends can get rather dry. This conditioner really helped to smooth my ends.